Sandra had always wanted to have her own farm since she was a child (not growing up on a farm). Her passion and mission in life, though, were not set until the day when her two jobs collided in the kitchen of a funky mountain hot springs resort in southern California. Working on the culinary team of a cutting-edge farm-to-table restaruant (although then it was called keeping food costs low) by night and a local cattle ranch by day where her boss didn't believe in feeding grain--remember, this was in the 80's. One day, the local meat purveyor walked through the door. Knowing him from her ranch work, she didn't put two and two together until he pointed out that she was cooking and serving the beef she was raising. One of her tasks at the restaurant was to shop at the local farmers markets twice a week as well as make the rounds to local farms and orchards to collect the freshest bounty the Ojai Valley had to offer. Little did she realized the seed planted that day, the feeling of pride and the comfort of knowing how the food had been raised would bear fruit nearly twenty years later when she walked through the dining room of Woodberry Kitchen carrying two goat carcasses from livestock she had bred and raised on her own farm. This journey has taken Sandra from ground zero of local foods and fine wines in southern California to the cradle of sustainable agriculture in the Mid-Atlantic region. Chefs and farmers alike seek her out for her gift of creating connections between getting food out of the pasture and on to the table. And along the way, those fortunate enough to sit at her table are graced with really awesome meals as well as the stories of how their sustainance came to be. 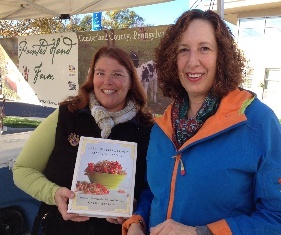 Readers can follow Sandra as she continues to promote local and sustainable food as well as well the politics and social issues that surround the modern food system. Sandra and world-famous humanitarian/chef Jose Andres. Sandra provides meat for both his personal use and for his DC flagship restaurant, Zaytinya.